On a recent JetPens order, where I picked up a fistful of Pilot Juice pens (so good! 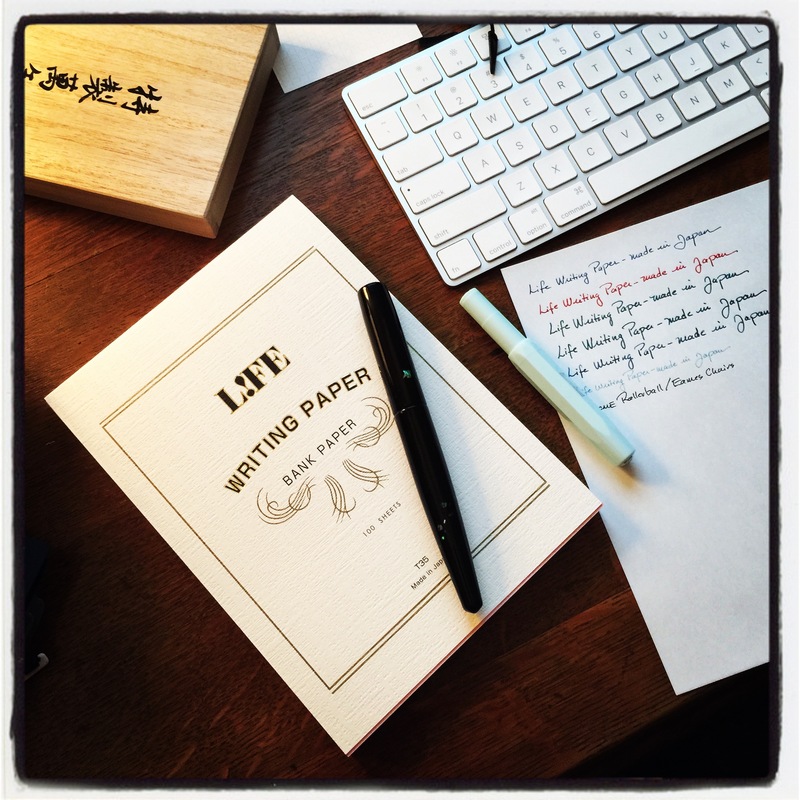 ), I randomly decided to throw a pad of Life Writing Paper into my cart. I’m not sure why, as I’ve been more than satisfied using Tomoe River Paper for the bulk of my letter writing. But, you know, the thrill of the hunt and all that. The other evening, I needed some pen-therapy so I collected a bunch of inked pens and tested out my new paper. 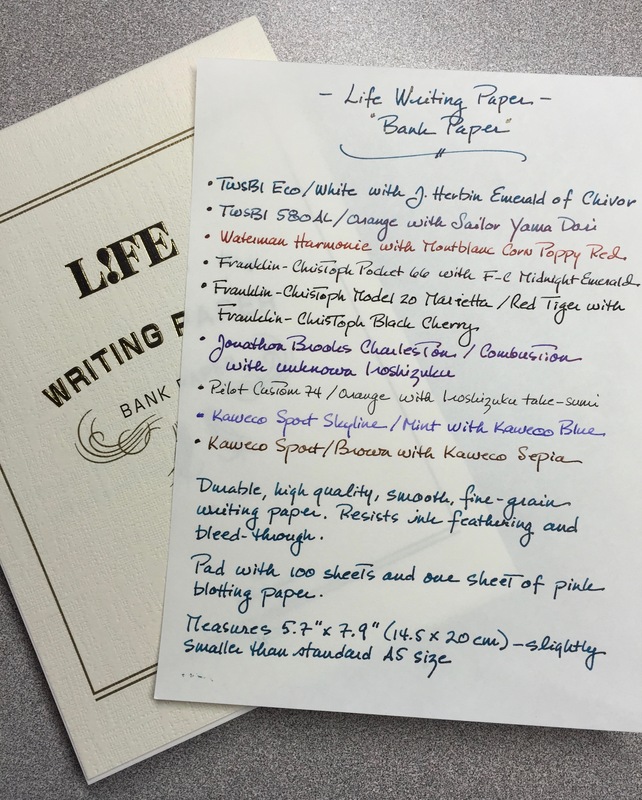 Made in Japan, JetPens calls this paper “luxuriously smooth” and says that it “resists ink feathering and bleed-through and doesn’t get roughed from the use of an eraser.” This “Bank Paper” pad is said to be durable and high quality, according to Life. 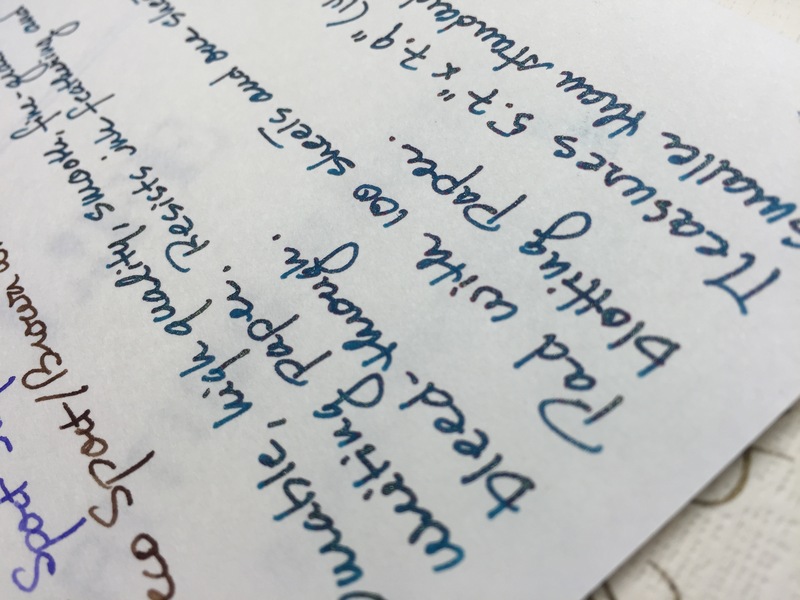 The Life Writing Paper is heavier than Tomoe River Paper, but exhibits the same qualities that have endeared Tomoe River to so many of us. I’ve confirmed that all of the claims appear to be true. Every pen I used, from a fine Pilot Custom 74 to a bold TWSBI ECO, behaved exemplary. No feathering, no bleed-through, but still a LOT of sheen. 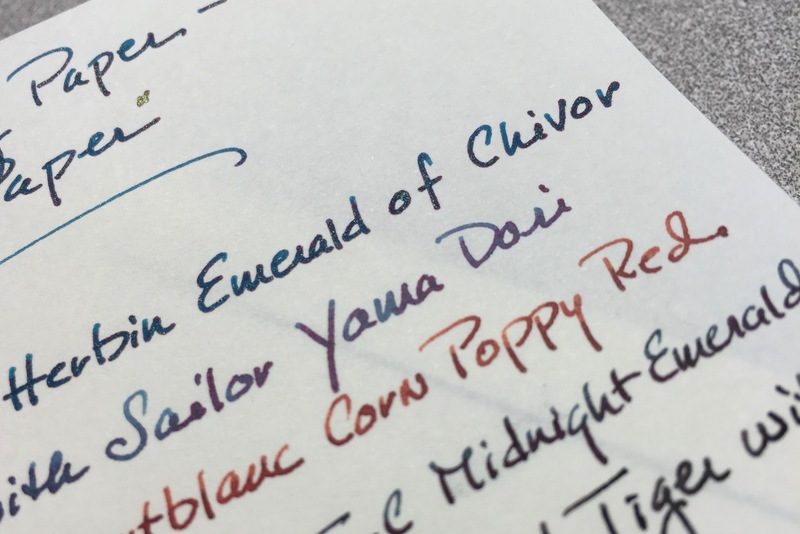 Emerald of Chivor’s sheen looks more dramatic in person, but you can get a sense of how it looks in a couple of my photos. Sailor Yama Dori sheens like crazy, too. 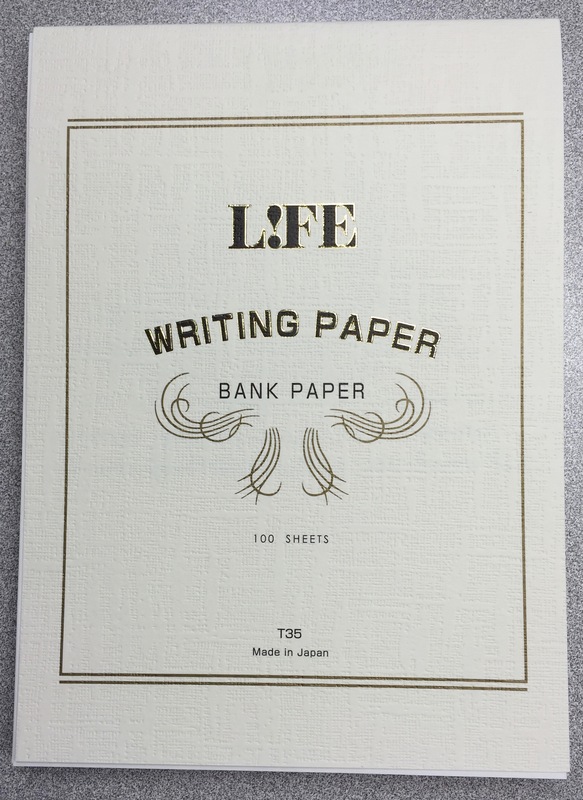 This 100-sheet pad of Life Writing Paper measures 5.7″ x 7.9″ (14.4 cm x 20 cm), which is slightly smaller than the standard A5 size. I love the size and find it much more convenient to carry than the large sheets of Tomoe River Paper. The pad is bound with glue, and pages tear off neatly every single time. One page of pink blotter paper is also included with the pad. I haven’t found dry times to be any more of an issue than with Tomoe River Paper, and they may, in fact, be a bit quicker. That’s just my impression. I can’t back it up with actual data at this point. How glad I am that I tossed this Life Writing Pad Paper into my JetPens cart at the last moment. It’s quickly become a favorite (in case you couldn’t tell). I love the Tomoe River Paper in my Hobonichi Techo, but for letter writing, the convenient size of this pad coupled with the paper’s outstanding characteristics, makes it a very real rival to our beloved Tomoe River Paper. 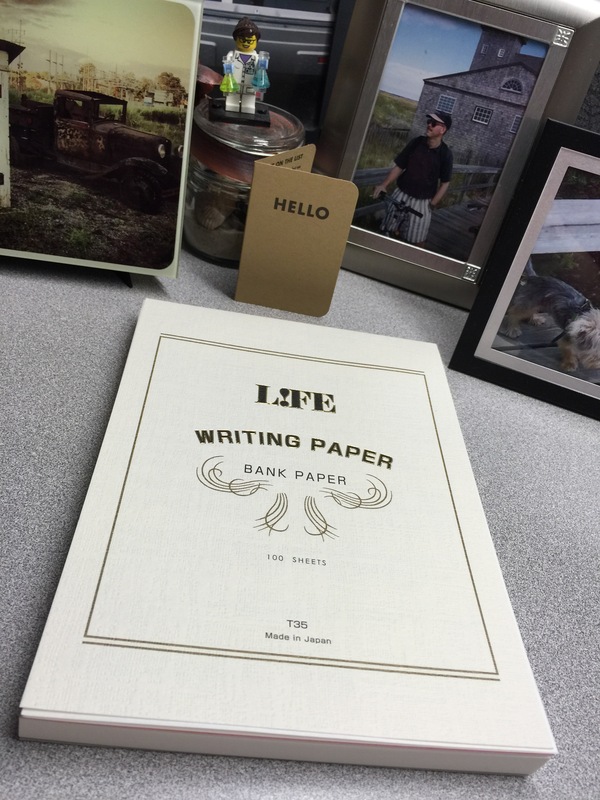 Life Writing Paper is available at JetPens where a 100-sheet pad costs $19.50. Not cheap, but, to me, it’s well worth the money. The paper reviewed here was purchased with my own funds, on a whim. Yay for whims! 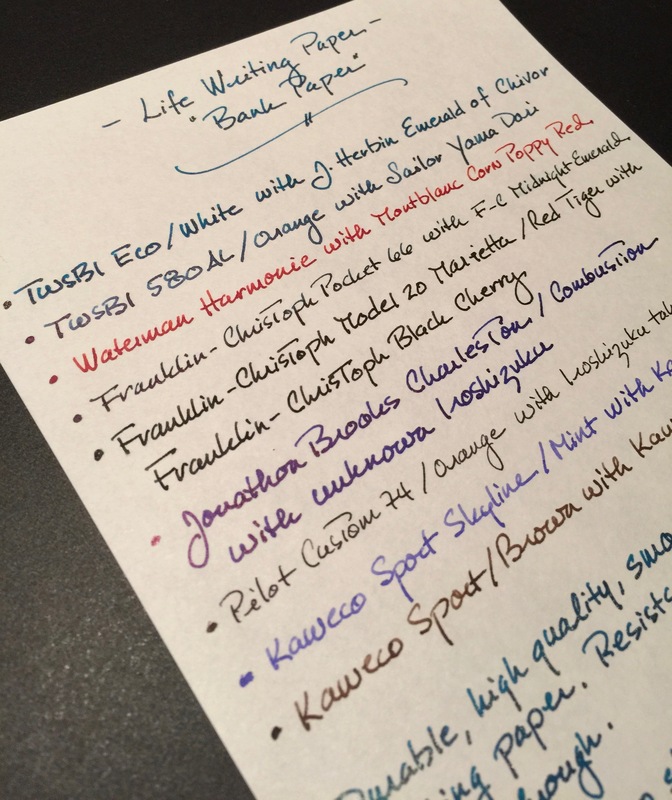 Have you tried PaperforFountainPens.com? They sell a Tomoe River “Correspondence Size” pad, slightly larger than A5, you get 3 100-sheet pads for $19.95. I’ve been using those recently. Oooooo…nice! Thanks for the tip!! I absolutely adore LIFE brand papers. For those who quibble about the thinness of Tomoe River this is the route to go. It just loves fountain pens & ink. Like yourself I find that it seems that the ink has a slightly quicker dry time than Tomoe River, and the best thing about them is that there is such a variety available…including envelopes. For your Canadian readers you can purchase this brand from Wonderpens at the url below (and if I recall a recent blog post correctly they will be soon carrying more from this line of products). Umm yes! I’ll definitely be checking this out. I’ll have to look and see if they sell this in larger sizes or in reams? I’ve been looking for Tomoe or something like it to make my own notebooks out of but this looks great. Thanks for the review!